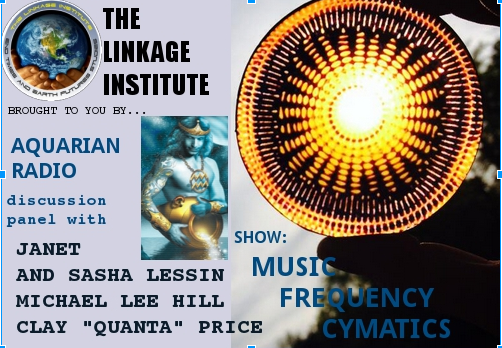 LINKAGE INSTITUTE – MUSIC, FREQUENCY CYMATICS – Discussion Panel with Janet Kira Lessin, Dr. Sasha Lessin, Michael Lee Hill and Clay “Quanta” Price. The Linkage Institute was the dream of AR Bordon for sharing the Life Physics Group discoveries. This series on Aquarian radio this dream being taken up by those inspired by this fascinating material. Today, the topic is “Music, Frequencies and Cymatics. How is it the ancients believed that our reality emanated from sound? People often talk about “frequencies” in terms of energy or “high vibrations” when talking about more positive and “low vibrations” means more negative, what is that about? How do sound and the quantum hologram ideas fit together? What is the study of “Cymatics”? Are crop circles a form of cymatics and what do they mean? What do the ancients, our ancestors and our visitors want us to know about sound vibration?? Ancient Advanced Mathematical Code Broken! – NEPHILIM-AMORITES, A LOST TRIBE OF ISRAEL, BECAME THE GIANT MOUND BUILDERS OF NORTH AMERICA! Guess what? All the most harmonious frequencies are encoded! Please take notice that both Crop Circles, A 27 Hz frequency creating the Enki-Ea Seven-Ponted Star, and the D 36 Hz frequency creating the Six-Pointed “E=MC2″ fall within these most harmonic numbers frequecies! So the 2010 “E=MC2″ crop circle encodes the D 36 Hz (432 Diaspan Related) “Particle/Mass” piece of the equation puzzle. With the Enki Crop Circle we now know Enki of the Anunnaki has been presenting us and guiding us with the importance of 432 HZ and it’s 4 octave below 432 Hz (27 Hz) (Diapason A 432 Hz) in the form of the seven-pointed star which is encoded into the Enki Crop Circle, and the D 36 Hz frequency creating the Six-Pointed “E=MC2″ fall within these most harmonic numbers frequecies! And they both are related to a 432 HZ Pythagorean tuning or Diaspan! Migration: The first research on living Native American tribes showed they were composed of four distinct mtDNA haplogroups called A, B, C, and D which means that the Native Americans are derived from four different lineages. These haplogroups were also found in native populations in Central and South America. Other mtDNA research utilizing ancient remains recovered in the Americas validated these four haplogroups. Three of these haplogroups, A, C, and D are found primarily in Siberian Asia. The B haplogroup, however, is found only in aboriginal groups in Southeast Asia, China, Japan, Melanesia, and Polynesia.